Hana will play KOSSA at 3:00pm on Saturday taking with them a 4 – 1 deficit against the in-form ‘men in yellow’. A double strike from Nicholas Muri and 1 a piece from Phillip Ashley and Paul Wale secured the first leg win for KOSSA and Hana could only manage a single reply through Tony Otini. Overcoming this deficit will require a herculean effort since Hana would need to score 4 times unanswered against KOSSA to win this clash. Hana’s coach, Rex Masuaku, says that his boys have prepared well during the week and will be taking the fight to KOSSA. Real Kakamora is in a more troubling situation as Koloale overtook them by 7 – 1 in their first meeting. The Tommy Mana coached side showed signs of a fight early in the game but allowed their much fancied opponents to run away with a big win. And the result is that they are faced with the daunting task of having to score 8 to nothing against a side which has only conceded a maximum of 3 goals as the highest score in one game. Koloale’s backline remains impressive and they have a forward pack to match with the likes of Telekom S-League top scorer, Benjamin Totori, who has found the net 21 times already this season. Real Kakamora will need to put on their best performance against Koloale just to come away with a win. Another club that will be struggling to offset against their opponent’s advantage is Marist Fire. In their first leg meeting with Solomon Warriors the second placed team from the league defeated Fire by 3 goals to nil in stunning show of control under extremely wet conditions at Lawson Tama. Marist Fire coach, Patrick Miniti, concedes that the upper hand belongs to Solomon Warriors but says that his players will be out to challenge them to the final minute. “We want to go out and enjoy the game. We want to finish the competition on a high note. Warriors are really doing well and we know that they are favourites for the finals. For us, what we want to do is put up a good fight in the true spirit of fair play,” Miniti says. Solomon Warriors are surely on fire at the moment and no mercy will be spared on Marist Fire. Their front pack has connected well and if they are in the same mindset they were last weekend things could get very dangerous for their opponents. Unlike the other championship matchups, the Western United v. Malaita Kingz duet was a somewhat more level affair. Their first leg ended in a 2-all draw but Western United are the happy ones since their 2 away goals may prove to be the difference should their second leg finish in a draw with a lesser score line. Malaita Kingz looked promising in their first game and they are slight favourites to take this tussle away when they meet again tomorrow. Western United looked to be lacking purpose without their coach and his return this afternoon will be an important confidence booster for them. 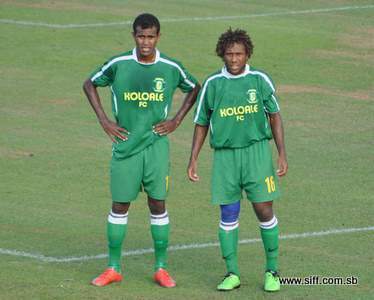 For Malaita Kingz turning their defensive strength into scoring will be their main issue. In past matches they have defended well but found it difficult ones it came to scoring. All in all the stage is set and all the clubs that will take the field this weekend will be out for a win since that would be all they need to finish within the prize bracket.